Whistler Performance Lubricants is a brand of high performance, bio-based bike lubricants and care products from Whistler, BC. The rider owned company creates biolubricants that meet the highest performance standards set and tested by the riders of the Sea To Sky corridor. 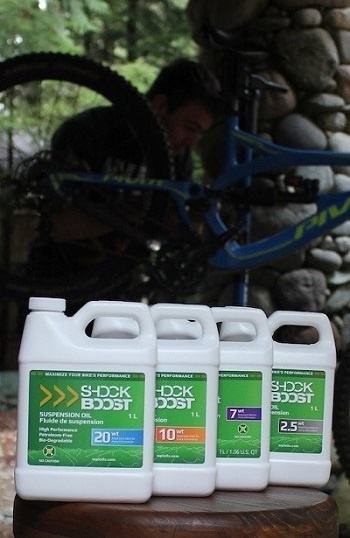 One of these products, ShockBoost suspension oil, is a bio-based suspension oil that is non-toxic and petroleum-free, with extremely high oxidative stability ratings and exceptional lubricating properties. – Suspension oil is the oil that is used inside of your bicycle suspension to lubricate and dampen the compression of the fork and rear shock. Different viscosities of oil are used depending on the design of suspension, and the preferences of the rider. – Suspension oil is commonly made of mineral oil and synthetic oil. Mineral oil is a by-product of petroleum refining, and synthetic oils are created by further cracking and modifying these molecules. These can contain toxic chemicals that are carcinogenic and bad for the environment. There is a new category of lubricant, made from renewable sources. WPL suspension oil is an advanced bio-based suspension oil, and falls into this new category. – Suspension oil that is inside of the damper cartridge of your suspension is designed to slow down the compression and rebound. If suspension did not have damping, then it would be as quick as a spring, and this would make for a terrible ride. Suspension oil that is in other places in the suspension is used for lubrication of moving parts. Sometimes suspension doesn’t have closed damper cartridges (called open bath dampers), and these use the same oil for both functions. – Weight is terminology for describing the viscosity of oil. The term weight can be misleading, because it is not an actual unit of viscosity, nor is it an actual range of viscosities. It is simply an industry term, used fairly liberally. Some companies have 5-weight oils that are fairly different in viscosity than other 5-weight oils. Another common mistake is mixing “winter” with “weight,” as in “5W-30.” Many people think this means “5-weight-30” and then treat the oil as a 5-weight oil. It is actually a “5-winter-30” oil, which falls into the 20-weight range. 5W-30 is a system of ranking engine oil created by the SAE (Society of Automotive Engineers) and is based on curve of viscosity over heat, but is completely irrelevant for use in suspension. The actual unit we should be paying attention to is cSt, see below. – This stands for centistokes, which is the actual scientific unit of measure for describing the kinematic viscosity of oil. To measure centistokes, you have to measure at a specific standard temperature, because all oil changes viscosity at different temperatures. Viscosity is commonly measured at 40°C and 100°C, and usually the first value is the one that determines what “weight” the manufacturer will name the oil. – Viscosity Index is a value that describes the amount of change in viscosity of oil between its values at 40°C and 100°C. The higher the VI, the less change there is. Less change means that there is less difference in performance and less fade in suspension damping. Therefore, suspension mechanics often look for the highest VI oil possible for their damper cartridges. The importance of VI does not apply to oil that is used for lubrication (since this oil will not heat up as much as the oil inside a damper cartridge). Some manufacturers design their suspension in a way that VI does not have any impact whatsoever. VI also often comes at the price of thermal stability. Since mineral and synthetic oils do not naturally have a high VI, manufacturers have to use large amounts of VI improving additives in their oil, which are prone to burning up while in use (this is why the oil is a different colour when changing it out). These additives also decrease the lubricity of the oil. – Lubricity is a characteristic of oil that describes how slippery and lubricating the oil is. Different types of oil have different abilities to reduce friction, mainly due to the shape of the molecules that make up the oil. 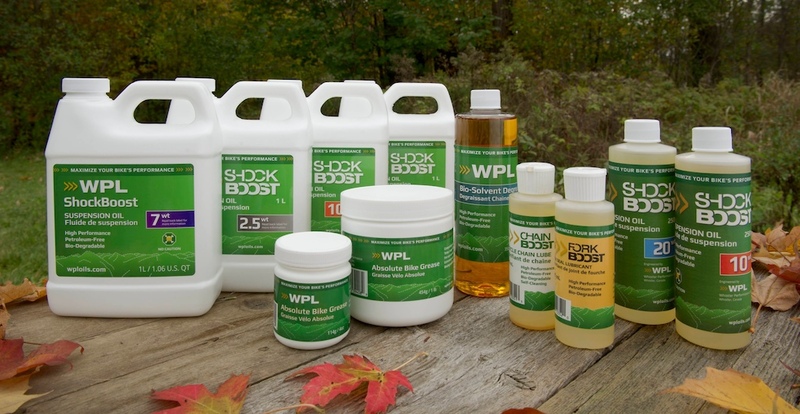 WPL uses bio-based oil blends that are extremely good at reducing friction, whereas mineral oils are not as good. Some synthetic oils have good lubricity, but not as good as bio-based oils. Bio-based oils provide the benefit of interacting with metal surfaces at a molecular level, because of the innate polarity of triglyceride molecules. WPL suspension oil also does not contain any additives for improving VI, heat stability, preventing corrosion, detergency, or any other functions of the oil, and therefore has better lubricity characteristics than oils that do (because there is less solid matter suspended in the oil).This should provide some basic understanding of how suspension oil is categorized, and what to look for when choosing what to put in your suspension. We also like to consult Peter Verdone’s suspension oil write up to see how different products rank up against each other. Check it out here. We hope you’ve learned something useful today. We’ll be posting more techy articles soon about lubricant products and how they’re made, stay tuned! For more information on suspension oil check out our video with Steve from Vorsprung on the “Tuesday Tune”.